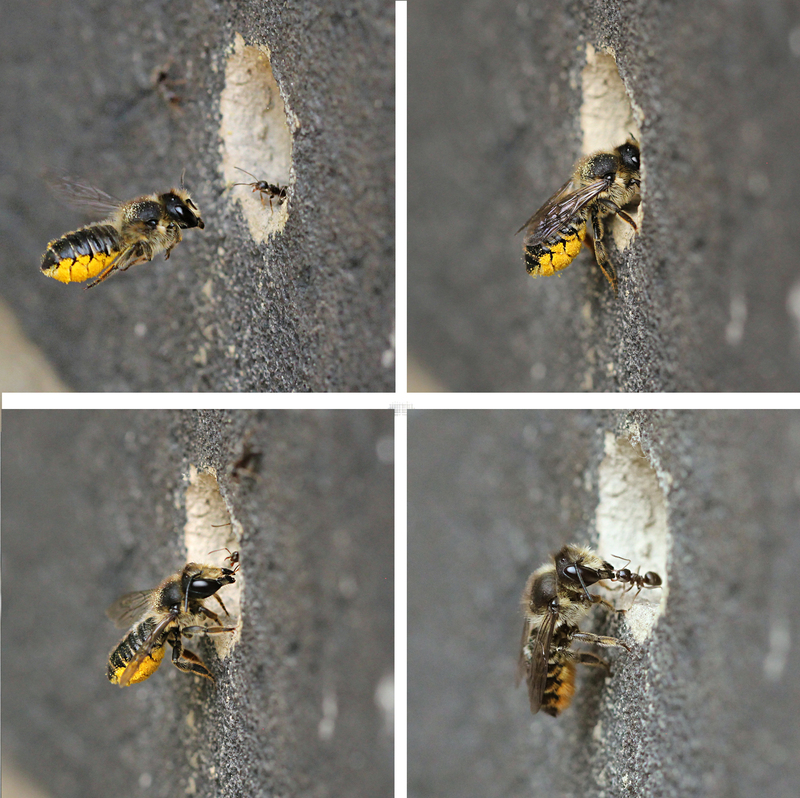 In my porch, a leafcutter bee has decided to build her nest in a damp-proofing hole in the wall. First, she had to excavate the mess left by a previous tenant – a spider – by pulling out all the debris. It’s early morning, and our bee has resumed her chamber-making duties. Her distant cousins, the ants, are running around eager to help. They are hoping for some pollen scraps. But it seems a password is needed to enter the nest – if you’re not on the list you’re not coming in. Luckily, our bee knows the secret code. She starts to line the cavity with leaves, cut to size and usually harvested from a rose bush, carrying the leaf plugs to the nest between her mandibles. These are plastered to the walls with saliva, creating a cosy chamber. During the day she collects pollen, stored on the hairs of her underbelly. She likes ‘flat’ flowers like daisies, so she can wiggle her abdomen over the stamens to collect the dust. The pollen is stored in the chamber for the bee larvae to feed on once hatched. Then she will lay an egg and seal up the chamber, creating a bijou home for one of her young. Once the first cell has been sealed up, she starts the whole process again. 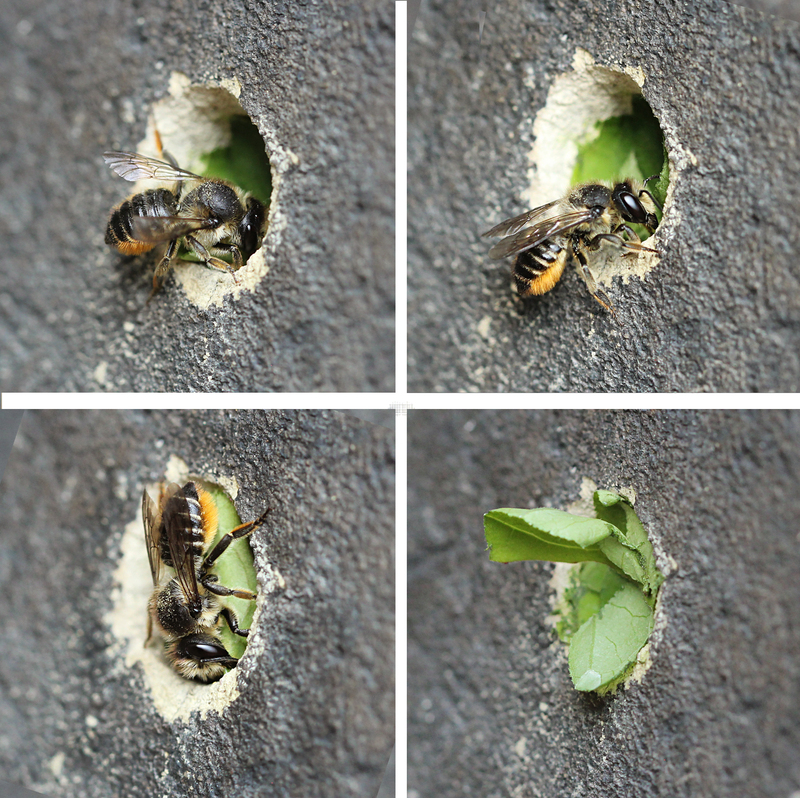 Depending on how long the cavity is, leafcutter bees will make enough chambers to fit. She could probably fit four chambers in a damp-proofing hole. Female eggs will be laid first, the male eggs last. Closing the nest up can be a tough job. It gets harder to fly in with a leaf, and the pesky ants are still in the way. Discarded leaves litter the ground below, unsuccessful attempts at negotiating a way to shove a leaf into a nearly full hole. Sealing the nest takes time and a lot of leaves and saliva to make it watertight and safe from predators. The young bees will emerge in spring, the males flying out first followed by the females. 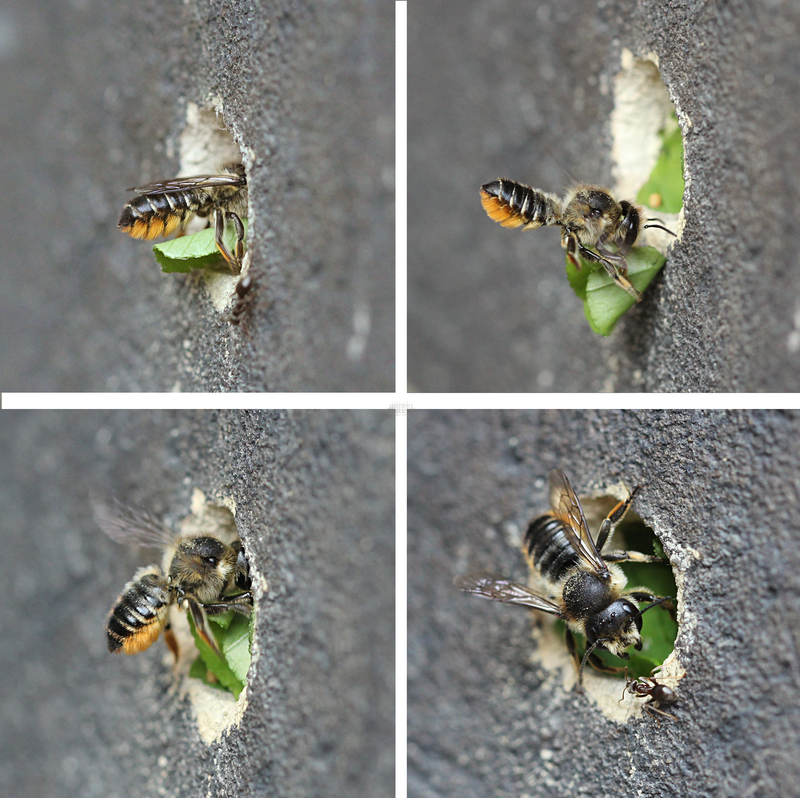 This entry was posted in Peckham and tagged bees, hymenoptera, Insectinside, insects, Leafcutter bee, London, London wildlife, Megachile bee, Peckham, Penny Metal, Solitary bee by insectinside. Bookmark the permalink.